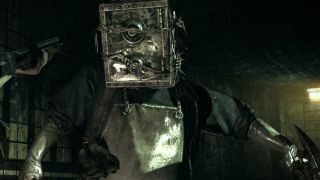 The next, and last, DLC release for The Evil Within will be a first-person experience seen through the eyes of the guy with a box on his head: the monstrous madman known as The Keeper. The announcement doesn't reveal much about The Executioner DLC, saying only, "Experience his power and brutality in first person as you square off against [the] most iconic adversaries of The Evil Within." The teaser isn't much better: Grab a giant meat tenderizer, throw a guy into a spinning spike trap, and chainsaw a dude in the face. Not that there's anything wrong with that—the ol' "chainsaw to the pie hole" trick is a timeless classic—but as compelling narratives go, it's a bit thin. On the other hand, now we know why The Keeper wears that safe on his head. The Executioner comes out on May 26.